Novels from top authors and illustrators with the variety children need to develop a love of reading! TreeTops Fiction contains a wide range of quality stories enabling children to explore and develop their own reading tastes and interests. It contains stories from a variety of genres including humour, sci-fi, adventure, mystery and historical fiction. These exciting stories are ideal for introducing children to a wide selection of authors and illustrators. There is huge variety to ensure every reader finds books they will enjoy and can read. Books contain inside cover notes to support children in their reading. Help with children's reading development also available at www.oxfordowl.co.uk. The books are finely levelled, making it easy to match every child to the right book. 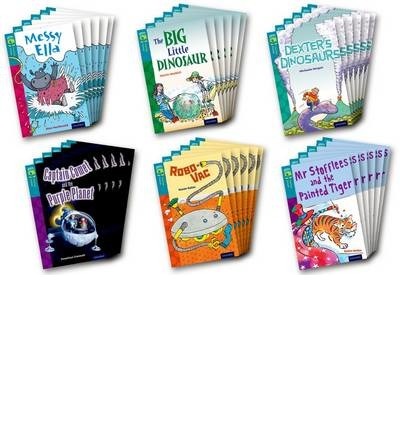 This pack contains 36 books, six of each of: Captain Comet and the Purple Planet, Messy Ella, Robo-Vac, The Big Little Dinosaur, Mr Stofflees and the Painted Tiger, Dexter's Dinosaurs.